SALT LAKE CITY — In today’s obvious news, teens are leaving Facebook. A new report from Pew Research Center found only 51 percent of U.S. teens currently use Facebook. That’s a drop from 2015, when Pew found that 71 percent of teens were Facebook users. At the time, Facebook was heralded as the most popular social media platform in the country. Now, other social media platforms — like YouTube, Instagram and Snapchat — have climbed the ranks for teens. YouTube leads the way with 85 percent, followed by Instagram with 72 percent and Snapchat with 69 percent. 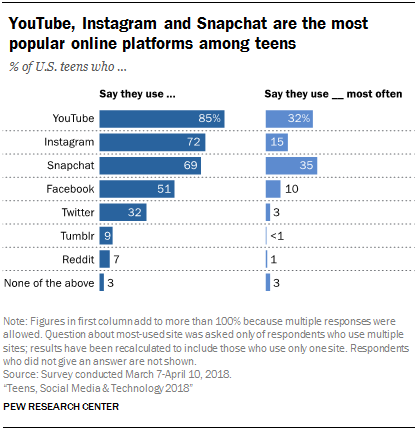 Snapchat and YouTube are used the most often, with 35 percent of teens preferring Snapchat and 32 percent preferring YouTube as their majority social media app. "Today, the majority use Instagram and Snapchat, which wasn't the case back then," Monica Anderson, a research associate at Pew and lead author of the report, told Mashable. There are some exceptions when it comes to teens using different social media platforms based on demographics. For example, lower-income teens are more likely to use Facebook, the report said. Though this seems like grim news for Facebook, it’s important to remember the company still owns Instagram, VentureBeat reported. According to Yahoo!, the report shows it will be difficult for Facebook to remain as the top social media platform in the U.S.
“The new study demonstrates how difficult it may be to keep up that level of dominance, and how important the 2012 Instagram acquisition has been for Facebook's future,” Yahoo! reported.